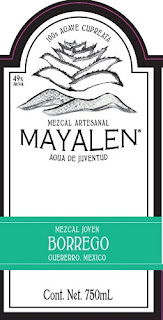 Mayalen Borrego (the Spanish word for "lamb") is an organically handcrafted mezcal made from wild cupreata agave hand picked by the maestro mezcalero. The BORREGO label is created from the Wild Cupreata agave species and was inspired by those who have a deep appreciation for sophistication and delicacy. This variety is complex with a silken texture. Earthen flavors with floral and citric notes linger in your palate after every sip of BORREGO. This spirit is triple-distilled and its exclusive recipe has been used by Mayalen’s maestro mezcalero’s family for many generations. The GUERRERO variety is created from the Wild Cupreata agave species and was inspired by those who are warriors at heart. It is potent with notes of white pepper and hints of citrus. The subtle dark chocolate aftertaste makes it ideal for pairing with nuts, berries and chocolate.